For several years, I've been on a quest to get an iPhone case that I can use when attending conferences and events, something I do pretty often in my role as an IT Professional, and as a blogger. When out and about all day away from power, I usually carry around a battery pack in my right front pocket. This is clumsy, unplugging and plugging back in, several dozen times per day, as I tweet and 4K video record my day away. 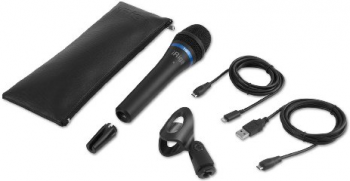 Amazon - IK Multimedia iRig Mic HD 2 high-definition handheld digital microphone for iPhone, iPad, Mac and PC - IP-IRIG-MICHD2-IN. The other thing I do at such events is impromptu interviews, with an external ambient noise-canceling mic. The thing is, those two things, battery and external mic, have been mutually exclusive: the mic took up the same lightning port as the battery. That's no longer a problem, with Apple’s surprise new accessory, and oddly timed release on January 17 2019. On Jan 18th, my Apple store app told me that none of these were in stock anywhere before next Tuesday Jan 22nd, both here in Connecticut, but also in Orlando Florida, where I'll be working at a conference all week. Figured I'll call my local store anyway, just in case. To my surprise and their’s, Dan from the Apple Business Team discovered that they had just gotten a few in hand, so I made payment to reserve one, then drove on over. Thank you Dan! Happily filled out the survey form, giving him a perfect 5. The Lightning Connector is a pass-through design! 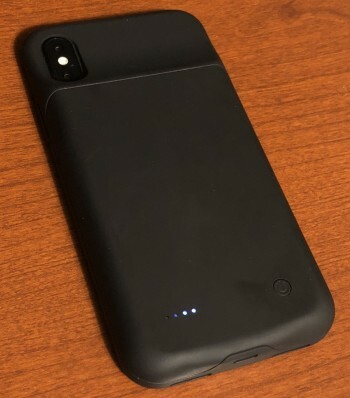 The design of the new Apple Smart Battery Cases simply pass through whatever you planned to do with that lightning connector. When using third party battery cases, this wasn't the case. Power was passed through, but not the signals. This off-brand battery case lasted me all of 2 months, sigh. Safety of off-brand batteries is suspect. Audio wouldn't pass through the Lightning port either. Apple iPhone X Accessories that feature Bluetooth, Qi Wireless Charging, and/or Lightning connectors for podcast enjoyment anywhere. That sure didn't go well, at all. Yes, I disposed of it properly, but I feel pretty crummy about contributing to e-waste, and wasting money. While I do have concerns over what will happen when Apple finally cuts over to USB-C for everything (not just their iPads), I'm confident I'll get plenty of use from this battery anyway. Yes, this device is also married to this particular phone, although it turns out to also (sort of) work with the iPhone X too, but there is very little chance it will fit and work with the next iPhone, and zero chance if they go to USB C this year. This battery is pricey but effective, with no secondary power switch to worry about, and a seamless physical and operational design that is likely to fit your needs for seamless battery life expansion. For my needs, it's by far the closest device to fit: pocketable, and allowing for external Lightning devices to still connect as if the battery wasn't even there. Mics, speakers, PCs, whatever, they all "just work." You can purchase these new cases at Apple, and each are available in either Black or White. Also available soon at B&H Photo & Video, all models listed here.